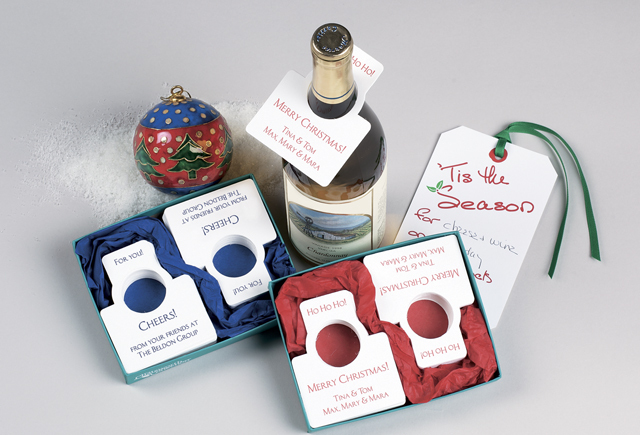 Description: Personalize the wine gifts you give with tags from your own "cellar"! Hang these personalized tags on the wine bottles you give to add a personal touch to the occasion. Or give them to your favorite wine connoisseur for his or her own gift giving! 50 Tags in a gift box with a clear lid. Specify navy, red or hunter ink. Type style as shown only. Specify any phrase or name exactly as you want it printed. Limit 4 lines of personalization; limit 14 letters & spaces for the first line, limit 24 letters & spaces for each additional line. Tags measure approximately 3" x 3 3/4". Choice of ink color: red, wine, lime, hunter, bimini, blue, navy, blakc, gold or silver.